BACKGROUND AND PURPOSE: The aim of this study was to determine the feasibility and usefulness of contrast-enhanced MR angiography (CE-MRA) for the follow-up of intracranial aneurysms treated with detachable coils, by comparing CE-MRA with digital subtraction angiography (DSA) and 3D time-of- flight (TOF) MRA. METHODS: Thirty-two patients with 42 treated aneurysms were included in the study; 6 had been treated for multiple aneurysms. All MRAs were performed with a 1.5T unit within 48 hours of DSA. We performed 2 types of acquisition: a 3D TOF sequence and CE-MRA. Twenty-eight patients were included 1 year after endovascular treatment, and 4 patients, after 3 years or more. DSA was the technique of reference for the detection of a residual neck or residual aneurysm. RESULTS: Compared with DSA, the sensitivity of MRA was good. For the detection of residual neck, there was no significant difference between the results of 3D TOF MRA (sensitivity, 75%–87.5%; specificity, 92.9%, according to both readers) and CE-MRA (sensitivity, 75%–82.1%; specificity, 85.7%–92.9%). For the detection of residual aneurysm, sensitivity and specificity of both techniques were the same, respectively 80%–100% and 97.3%–100%. Therefore, CE-MRA was not better than 3D TOF MRA for the detection of residual neck or residual aneurysm. For large treated aneurysms, there was no difference between decisions regarding further therapy after CE and 3D TOF MRA, even though CE-MRA with a short echotime and enhancement gave fewer artifacts and better visualization of recanalization than 3D TOF MRA. The interpretation of transverse source images and the detection of coil mesh packing seemed easier with 3D TOF imaging. CONCLUSION: This prospective study did not show that CE-MRA was significantly better than 3D TOF MRA for depicting aneurysm or neck remnants after selective endovascular treatment using coils. For aneurysms treated with coils, 3D TOF MRA seems a valid and useful technique for the follow-up of coiled aneurysms. MR angiography (MRA) may provide a noninvasive alternative with less discomfort and morbidity for patients. Previous authors have also reported good sensitivity6, 7 for 3D time-of-flight (TOF) MRA in the detection of aneurysm reperfusion. The purpose of this study was to evaluate the efficacy and usefulness of CE-MRA for the detection of residual flow in the follow-up of intracranial aneurysms treated with detachable coils. Our usual follow-up protocol for aneurysms selectively treated with coils is MR imaging and MRA at 3 months, and MR imaging, MRA, and DSA at 1 year. Subsequent follow-up is performed by using MR imaging and MRA. In this study, patients were prospectively and consecutively included if they harbored 1 or multiple aneurysms selectively treated with coils and if a follow-up angiography was scheduled according to the usual follow-up protocol. Thirty-two patients with 42 treated aneurysms were included in the study. Six had been treated for multiple aneurysms. Patients were between 25 and 73 years of age and comprised 27 women and 5 men. Thirty-six aneurysms (86%) were in the carotid system (anterior communicating artery, 10; internal carotid artery and posterior communicating artery, 20; middle cerebral artery, 6), and 6 (14%) were in the vertebrobasilar system (basilar artery and posterior cerebral artery, 5; and posterior and inferior cerebellar artery, 1). The size of the aneurysms ranged from 3 to 19 mm (3–9 mm in 27 cases, 10–14 mm in 13, and >15 mm in 2). All MRAs were performed within 48 hours of DSA. Twenty-eight patients were included 1 year after endovascular treatment, and 4 patients, 3 years or more thereafter. In these 4 cases, the follow-up angiography at 1 year was delayed for clinical reasons or because the patient was temporarily lost to follow-up. All DSA studies were performed on an Integris V3000 angiographic system (Philips Medical Systems, Best, the Netherlands) with a matrix of 1024 × 1024. Selective catheterization of the vessel harboring the aneurysm was performed. DSA images were obtained in multiple views, including the working views determined during preoperative DSA. A bolus of 8 mL of nonionic contrast material (iomeprol, Iomeron, Guerbet, Roissy, France) was injected at 4 mL/s during each acquisition with a power injector. MRA was performed with a 1.5T scanner (SIGNA, GE Healthcare, Milwaukee, Wisc) by using a standard head coil. Sagittal T1-weighted spin-echo imaging and axial T2-weighted fast spin-echo imaging were performed. MRA was first with 3D TOF parameter imaging with the following conditions: field of view, 22 cm; TR/TE, 35/3.4 ms; flip angle, 20°; section thickness, 1.4 mm; and acquisition time, 6 minutes. CE-MRA was performed next, as follows: field of view, 22 cm; TR/TE, 6.6/1.5 ms; flip angle, 35°; section thickness, 1.4 mm; and acquisition time, 58 seconds. A bolus of 20 mL of gadoteric acid at a concentration of 0.5 mmol/mL (Dotarem, Guerbet) was injected at 2 mL/s with a flush of 20 mL of saline, by using a power injector. The angiography started automatically with bolus detection (SmartPrep technique, GE Healthcare). MR angiograms were postprocessed on a workstation (Advantage Windows 3.1; GE Healthcare). The reconstructions of MRA source images and standard and targeted maximum intensity projection (MIP) images were interpreted in a blinded fashion by 2 trained neuroradiologists (F.B. and D.B.) who were not aware of the DSA findings. Sensitivity and specificity were calculated for each reader, and interobserver agreement was also evaluated. DSA images were interpreted independently by another neuroradiologist (L.P.) who was not aware of the MRA findings. DSA was the technique of reference. The results of DSA and MRA were graded according to the classification of Raymond et al14 as follows: complete occlusion, residual neck, and residual aneurysm. Artifacts were also evaluated, as minor when they did not prevent image interpretation and as major when they degraded image quality. Minor coil artifacts were seen in 7 cases. In 1 case, they interfered with image interpretation. Major artifacts were observed in 2 cases because the patient moved and in 1 case because of magnetic susceptibility (Fig 1). Top of right carotid ophthalmic aneurysm treated by endovascular coiling in a 49-year-old woman. A, 3D TOF MRA transverse source image shows a hypersignal around the aneurysm (arrow). B, 3D TOF MIP anterior projection shows a hypersignal in the projection of the packing coil. C, DSA right carotid angiogram, lateral view, shows no recanalization of the sac. Magnetic susceptibility was responsible for unclear TOF MRA imaging. Major artifacts were observed in 7 patients: in 6 because of venous enhancement (Fig 2) and in 1 patient because the scanning was started too early. No minor artifacts were observed. Left middle cerebral artery aneurysm 3 mm wide treated by endovascular coiling. Note a residual aneurysm (arrow). A and B, 3D TOF MRA transverse source image and MIP anterior projection show the clear visualization of the small treated aneurysm and remnant flow. C and D, CE-MRA source image and MIP anterior projection show that the packing coil is difficult to locate because venous enhancement affects image interpretation. E, DSA left carotid angiogram, anterior view, shows residual aneurysm. At the end of treatment, total occlusion was observed in 27 (64%) of the 42 aneurysms and subtotal occlusion in the remaining 15. At follow-up examinations, the anatomic results were complete occlusion in 14 cases (33%), residual neck in 23 (55%), and residual aneurysms in 5 (12%). According to 1 reader, there was no difference between the sensitivity of 3D TOF MRA (75%) and CE-MRA (75%). Specificity was 92.9% for 3D TOF MRA versus 85.7% for CE-MRA. According to the second reader, the sensitivity of 3D TOF MRA was 85.7%. For CE-MRA, sensitivity was slightly lower, at 82.1%. Specificity was the same for both techniques (92.9%). Therefore, the differences between the 2 techniques for these parameters were not significant; neither was CE-MRA better than 3D TOF MRA for the detection of residual neck. Interobserver agreement was evaluated separately for the 2 MRA techniques and considered good (for 3D TOF 88%, κ = 0.8; and for CE-MRA, 83%, κ = 0.66). Differences of analysis correlated with the small size of the residual neck, which was often between 1 and 3 mm wide. All residual aneurysms (5 patients) were detected with the 2 MRA techniques by the same reader (sensitivity, 100%; specificity, 100%). According to other reader, 1 patient with a small residual aneurysm on DSA was considered to have a residual neck on both 3D TOF and CE-MRA (sensitivity, 80%; specificity, 97.3%). For large aneurysms, better visualization of the residual aneurysm was obtained with CE-MRA than with 3D TOF MRA (Fig 3). However, the difference was not significant in this study because of the small number of large aneurysms (only 2 >15 mm wide). Giant aneurysm with no neck, incompletely treated with coils. A large residual flow is present inside the aneurysmal sac. A, 3D TOF transverse source image shows that the signal intensity inside the treated giant aneurysm (arrow) is degraded. The limits of residual flow are not clear between the strong flow signal intensity, the intermediate slow or turbulent flow signal intensity, and the intermediate blood clot signal intensity. 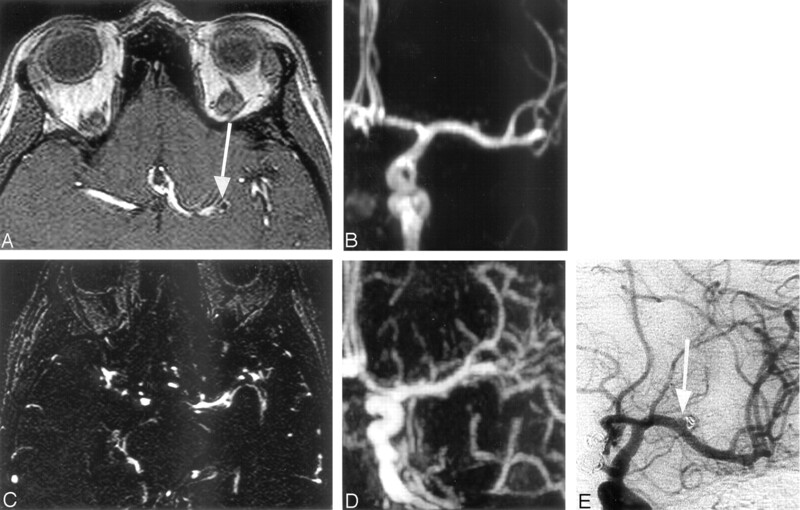 B and C, CE-MRA source image and MIP anterior projection show that the remnant aneurysm is clearly defined and the visualization of the carotid branch conformation with the aneurysm is better. D, DSA right carotid angiogram, anterior view, shows large residual aneurysm. On source images, the packing of coils was clearly identified and delimited (Fig 4) by 3D TOF MRA for all patients but was difficult to identify on CE-MRA source images. Source imaging shows treated aneurysm of the right posterior communicating artery. A, 3D TOF MRA transverse source image affords clear visualization of the low signal intensity of the coiling pack and the presence of a residual neck (arrow), but with CE-MRA source image (B), no delimitation is possible. DSA image confirms the presence of a residual neck (arrow, C). Derdeyn et al7 reported 71% sensitivity and 89% specificity for MRA, and Anzalone et al,6 97% sensitivity and 100% specificity. The authors also stated that 3D TOF MRA is a valid technique for the follow-up of treated aneurysms (Fig 5). We found the same sensitivity for CE-MRA and 3D TOF MRA (75%–85.7%) with good specificity (93%–100%). All false-negatives concerned small residual necks (2 mm wide or less) and had no therapeutic consequences. In a 25-year-old woman, a ruptured top carotid aneurysm treated during the acute phase by total occlusion and follow-up imaging 1 year later. A, 3D TOF MIP anterior projection. B, Contrast-enhanced MR MIP anterior projection. C, DSA intracranial right carotid TOF MRA and CE-MRA (B) show concordant findings in agreement with those of DSA. DSA imaging confirms the presence of a residual neck. In addition to the long acquisition time, 3D TOF MRA is limited by spin dephasing and saturation in slow flow or turbulence in aneurysm recanalization.7, 15 One solution was to use a short echotime (TE) and smaller voxel, but this did not result in significant improvement.8 To prevent spin saturation, contrast material injection was tested in a few studies.6, 9,10 It is probably useful for giant aneurysms, in which the extent of recanalization is clearer. For 6 large and 3 giant aneurysms, Anzalone et al6 found that the addition of contrast material helped to identify regions of slow flow and provide a better definition of the aneurysm recanalization. In other cases, the results showed no significant improvements and a longer time was required for postprocess imaging because of venous enhancement. Our study showed good sensitivity for both 3D TOF MRA and CE-MRA, though intravascular contrast and small vessel visualization were better with the latter. We believe that as shown in our results, this finding was because of the importance of the interpretation of source imaging. With 3D TOF MRA, stationary tissue is visualized, and the delimitation of the low signal intensity of the coil mass in the aneurysm is clearer (Fig 4). In a study of 39 patients, Yamada and al16 concluded that targeted TOF MRA was better than DSA for the visualization of residual aneurysms. In their study, the parameters and imaged volume were adapted to the location of the aneurysm. To diminish spin dephasing, they used a very short TE and a small field of view. Using the first pass of contrast material, we found that CE-MRA reduced the saturation or turbulence effect.13 The contrast in the vascular lumen was more marked, and the images were closer to those obtained with DSA13, 17 (Fig 3). In an initial study, Leclerc et al17 reported that CE-MRA was feasible for the follow-up of anterior communicating artery aneurysms, with good agreement between MRA and DSA. They reported 100% sensitivity with CE-MRA in the detection of residual neck, compared with 60% for 3D TOF MRA. In another publication, these same authors18 confirmed their results in a larger cohort. Several aneurysm locations were included, but most patients had anterior communicating artery aneurysms. CE-MRA was compared with DSA. All aneurysm recanalizations were detected, with 2 false-positives.18 The MR imaging equipment used by Leclerc et al and our center is not the same, but the field strength is similar. The sequences used by Leclerc et al and our study were close. Thus, technical factors probably did not contribute to the difference between our conclusions. In the publications by Leclerc et al17 and Gauvrit et al,18 anterior communicating artery aneurysms were predominant. In this topography, venous enhancement rarely interferes with image interpretation. Venous enhancement is indeed sometimes a limitation to the interpretation of CE-MRA, especially near the skull base and near the middle cerebral artery aneurysms13 (Fig 2). In our series, major artifacts of venous origin were observed in 6 cases with CE-MRA. Moreover, with 3D TOF MRA, spin saturation is greater in this topography because the first segments of the anterior cerebral arteries are parallel as a result of the orientation of the field of view of 3D TOF MRA. Consequently intra-arterial contrast may be degraded in this topography. It was also more difficult to read axial source images in CE than in 3D TOF MRA because of the strong saturation of stationary tissues and the smaller signal intensity/noise ratio around the angiogram. Therefore, with CE-MRA, postprocessed MIP images constituted most of the images analyzed (Fig 4). In the detection of aneurysmal recanalization, we found the same sensitivity as that reported in the literature, and the same sensitivity with the 2 MRA techniques. Leclerc et al17 did not include source images for interpretation, but only MIP projections. However, the dynamic reading of MRA source images constituted a large part of our interpretation, and in CE-MRA source images, the difficulty of identifying the coil mass is a real limitation. According to Leclerc et al,17 the benefit of a contrast-enhanced sequence is partly related to the fact that it is possible to use a shorter TE and reduce the number of artifacts because of magnetic susceptibility.8, 17 In our study, coil artifacts indeed seemed less apparent on CE than on 3D TOF MRA images, but we had no false-positive artifacts in 3D TOF MRA, and artifacts were always considered as minor. CE-MRA may be useful for the characterization of giant aneurysm recanalization (Fig 2). Thus, previous authors reported that the extent of recanalization was clearer with contrast material.6, 9 With TOF MRA, they found that artifacts, including a decreased signal intensity in slow or turbulent flow and the intermediate signal intensity of a blood clot, were suppressed. However, in our cases, the results of the 2 imaging techniques did not give rise to differences in the decisions regarding further therapy. Because of the better visualization of small arteries with CE-MRA, it can be used for distal artery aneurysms, such as pericallosal aneurysms. According to the sensitivity and specificity of MRA for the detection of neck or aneurysmal remnant, our results are not significantly different from those of our previous series.9 Consequently, our previous follow-up protocol was not modified here: MRA at 3 months and MRA and DSA at 1 year. Three-month MRA is performed to depict a potential aneurysmal recurrence or remnant, for which additional treatment may be necessary. Because the sensitivity of MRA is between 75% and 85.7% for the detection of neck remnants, DSA and MRA are performed at 1 year and MRA and DSA results are compared. Subsequent follow-up is based on MRA and DSA findings at 1 year. In our series, all except 1 residual aneurysm was clearly depicted by both readers. One reader classified a small residual aneurysm as a residual neck. Some residual necks were not depicted, generally because of their small size. Finally, from a clinical point of view, MRA is sufficient to determine whether an additional treatment is necessary. We continue to perform a DSA at 1 year because this technique is more precise and allows us an opportunity to schedule a follow-up. If no residual aneurysm is visible at 1 year on both DSA and MRA, the next follow-up step is MRA at 3 years. If MRA and DSA show a residual neck or aneurysm or if there are discrepancies between MRA and DSA, MRA is performed 2 years after treatment to depict any potential modifications of the aneurysm. Our final goal is to follow up aneurysms by MRA only, but unfortunately the sensitivity of MRA does not improve with CE-MRA. New sequences using higher field strengths need to be evaluated. The duration of follow-up necessary for aneurysms treated with coils is still unknown. MR angiography emerges as the technique of choice for long-term follow-up. 3D TOF MRA is a useful technique for the long-term follow-up of coiled aneurysms. In our series, CE-MRA was not better than TOF MRA for the follow-up of small and medium-sized treated aneurysms. Nevertheless, CE-MRA may benefit from the progress of MR imaging in the resolution of ultrafast sequences, and we intend to continue evaluating this technique in a larger cohort, by using a high-magnetic-field unit (3T). MR Angiography Follow-Up of Aneurysms Treated with Coils: Is There a Need for the Use of Gadolinium?